In my last post I wrote about my attempt to create my geographically co-located village. And although I was following my Speed Blogging Rules (i.e. no censoring), I’ve continued to feel uncomfortable about having it out there in the blogosphere. I mean, who wants to publicize that it’s hard for her to make friends? Plus, I try to focus more on for whatever I’m grateful than for whatever I’m wishing. So today’s post will be about the flipside of the search for my local village: my abundant virtual village. Last weekend I spent an enjoyable few days in Jersey City (who knew?) with my mastermind “sisters”. 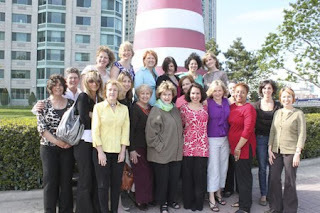 I was inspired in multiple ways by my coach Heather Dominick and the 18 other women entrepreneurs in this group, all of with whom I feel a special kinship. We celebrate each other’s successes and collaborate to support each other where we struggle. We encourage each other to step up to be the powerful women we are each meant to be, both with cheerleading and with tough questions. We have an active on-line community, but nothing beats face-to-face time, when we present, dine, and dance together. When I returned, I went running with my friend Cristin, a former colleague with whom I’ve recently connected on a more personal level. We are at different points in the development of our businesses and our families, but on similar journeys. I am grateful we have deepened our connection. Last week I also had the pleasure of Skyping with a new friend and coach, Bea Benkova. She asks wonderful questions, pushing me to explore my fears and doubts, as well as challenging me to accept my own gifts. She asked me to articulate who I am, what I stand for, my promise to my clients, pointing out that as I grow, everything not aligned with my vision for myself will be spotlighted, awaiting my choices so that I can continue to transform. I stand for feeling joyful, illuminated, and open to receiving as well as giving. I am passionate about helping my clients access these experiences in their lives and businesses as well. I am ready to release anything that’s eating my vital energy so that I can create large leaps with freedom and ease. For myself and my clients, I must let go now so I can leap later. As I write this post I’m having an “a-ha” moment. I can and do hold three different perspectives at once: I am still struggling to feel connected locally; I am deeply grateful to have wonderful women from around the world in my life and business; I am increasingly able to embrace the fact that in some real ways, I am alone. Building on one of Heather’s themes from our mastermind, I am very aware that where I am committed, I’ll do whatever it takes to succeed, and where I’m merely interested, I’ll do only what’s convenient. It is not convenient for me to build my business while caring for my children and navigating the legal system on the path to divorce. Fortunately, with the support of my virtual village, my vision is clear and my commitment is strong. I’m here, locally and globally, virtually and in person, for the long haul. Thank you. That means a lot to me, as does my connection to *you*! Ready for our next run and talk any time! I so know! It's my joy to be connected with you this year, and for a long time to come. I definitely used to equate lonely and alone. Since I've become a mom, I've learned to relish my alone time. When I want it, I love it. I'm practicing appreciating it even in those moments that it feels suboptimal to me. It's true – uberconnected internet wise certainly doesn't seem to equal uberconnected people wise. Perhaps it even deters it? That said, I'm not willing to give back my devices or my high-speed connections! Love it! I love your vulnerability. I too have had challenges creating heartfelt and lasting connections with friends…and while sinking into the meaning of when & why people come into and leave our lives is a spiritual practice… sometimes we just want our village, you know? SO grateful to know you & I only look forward to deeper connections. Keep on shining & keep on blogging! Great post! Nothing wrong with writing about ups and downs or wishing for things like more of a physical community. Your blog seems quite transparent to me which blogs need to be to truly connect with people. Vulnerability is good — mixed in with everything else you are writing about here. And yay kudos to your virtual community — SO glad and grateful to be connected with and able to support you and be supported by you there! Woo Hoo! I was thinking about your recent posts and I realized how today's uberconnected world leaves us actually feeling more alone than we already are. When I read literature from the 1800's or even from the early 1900's, there are so many alone moments in these novels that we never experience nowadays. Think of Tess of the D'Urbervilles or The Sound and the Fury, or even the Catcher in the Rye. I think the main difference today is that we're somehow trained to equate alone with lonely, and I'm not sure if they're the same thing. Debra, I really admire your open honesty on this blog and am looking forward to reading more!